When looking at the latest server technology, peak component performance, airtight security, and intelligent automation are the features that top the priority lists of IT pros. After all, hardware choice ultimately determines your enterprise’s ability to meet IT transformation demands. 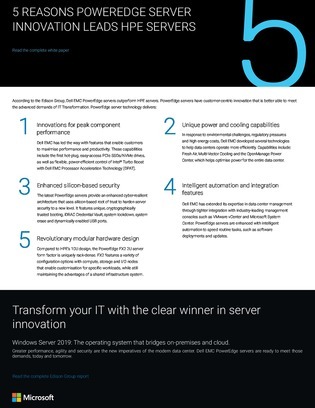 Inside, find out the 5 reasons why Dell EMC’s PowerEdge server family is quickly emerging as the hardware of choice for forward-thinking firms, and how it stacks up against competing offers from HPE in terms of performance, security capabilities, and more. Trademarks: Dell trademark is of Dell Inc. or its subsidiaries. All other trademarks are the property of their respective owners.